If you have a Blu-ray player, a Roku, external speakers, and a PlayStation all hooked up to the same TV, you might have experienced the frustration of having to switch between devices. It’s fine if you have enough HDMI ports on your TV, but with modern TVs only having two or three, most people run out fast. This is particularly true for cord cutters who might have additional streaming devices like an Amazon Fire TV or a Google Chromecast. Excessive HDMI devices leaves your entertainment center cluttered and creates the need to get up and swap plugs frequently. Thankfully, HDMI switches can add additional HDMI inputs to your TV and allow you to quickly swap between them with a remote. Most 4K HMDI switches are fairly inexpensive, especially considering how useful they are and how simple their setup can be. With additional features like Picture in Picture mode, a remote controlled HDMI switch isn’t only hardware; it’s an integral part of your entertainment setup. Zettaguard is not only an incredibly popular HDMI switch, it’s also one of the biggest names in multimedia accessories across the board. With many of their accessories needing HDMI ports, it only makes sense that Zettaguard released an HDMI switch to make changing between their devices easier. 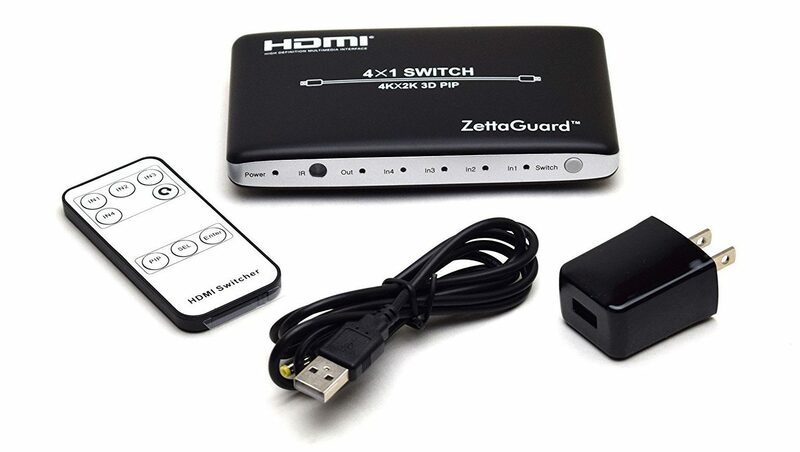 The Zettaguard HDMI Switch has over 2,000 Amazon Reviews and for good reason. One of the primary purposes of an HDMI switch is to help consolidate your wiring and help make your media center more presentable. The Zettaguard HDMI switch won’t let you down as one of the visible pieces of hardware in your entertainment center. It’s compact silver and black design blends into most media centers and doesn’t take up too much room. It’s about as small as it can be while still leaving room for the four HDMI-in ports, the HDMI-out, and the power connection. The only real design complaint we have is how bright the indicator lights are. There are six lights on the front of the switch that indicate different statuses. As long as the switch has power, the power light is on and red, the HDMI-out light is red or green, and the HMDI-in lights are red or blue. The colors for the HDMI indicators are based on what’s plugged in and what is being used. If something is connected to the HDMI-out port but not in use the light is red and will turn green while being used. The same is true for the four HDMI-in indicators except instead of turning green they turn blue. If you already have other devices with lights on their faces it might not be a big deal, but we ended up fastening a piece of glossed plastic over the face to help dim the lights a bit. There are a few features that make the Zettaguard HDMI Switch more than just a splitter for HDMI cables. The most basic difference is that it’s an HDMI switch with a remote and you won’t have to get up to swap between devices. The remote itself is fairly basic, with smooth white buttons along the face. The main buttons are for inputs one through four and there are additional buttons that control Picture in Picture mode. Picture in Picture mode is what makes the Zettaguard Switch feel like a useful part of your entertainment system and not just a hardware necessity. 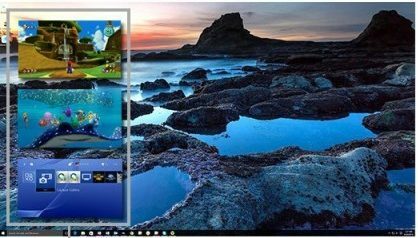 It allows you to display any number of your four HDMI connected devices on the screen at the same time. It will play one large image and up to three smaller ones along the side. The PIP feature is great if you’re watching a game and want to browse during commercials or even want to watch two games at the same time! 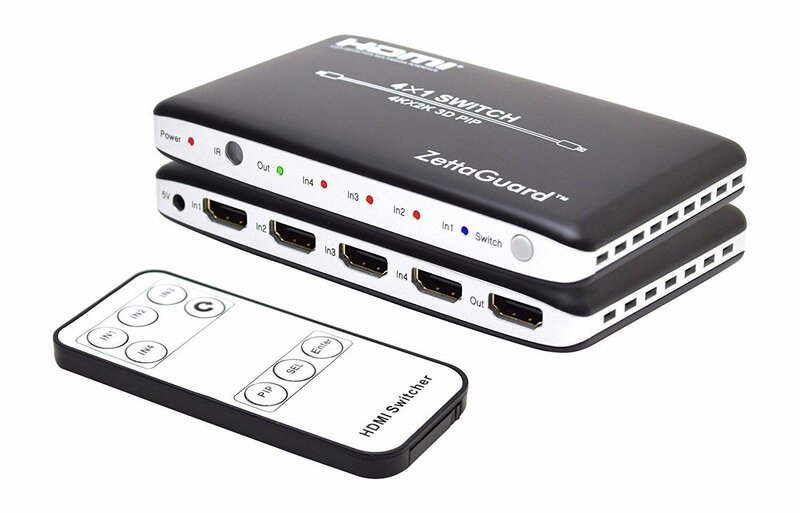 The Zettaguard HDMI Switch controller provides a few different ways to control which input is displayed. The simplest way is to use the IN1 through IN4 buttons and go directly to the output. The only problem with this is that you need to know which device corresponds with each number. It can be tricky to figure out which device goes to each number at first because the light layout on the box is inverted from the controller. The controller has IN1 on the left and increases to the right, but the switch itself is the complete opposite. It’s a minor thing to complain about, but it seems like such an odd choice for an otherwise well designed switch. Another way to change the displays is to use the SEL button, which will give you a visual display of what’s on each input. This same button allows you to cycle between content that’s played on your compact displays in PIP mode. The Zettaguard HDMI Switch is our favorite due to its reliability, price, design, and functionality. A majority of switches on the market today are industrial looking black boxes that don’t fit in well with the other hardware on most media centers. The Zettaguard’s exterior design lets it stand strong alongside your other hardware while taking up less room than a lot of its competitors. With 4K and 3D support plus having 4 HDMI-in ports, it’s hard to beat the price of the Zettaguard Switch. Their customer support is fantastic and is quick to resolve any issues that might pop up. Considering our two biggest issues with this switch are the bright lights and the difference in labeling for the controller versus the switch, it’s easy to see why it’s our favorite. 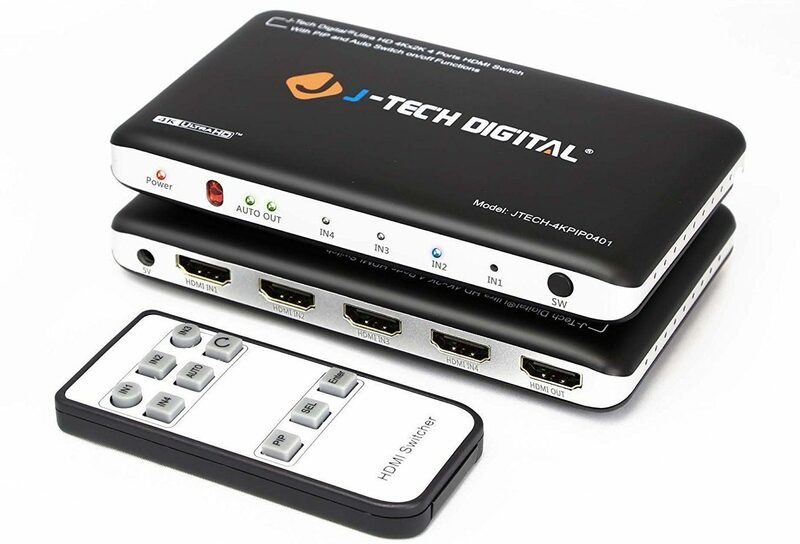 Another widely popular multiple HDMI switch is the J-Tech Digital 4K HDMI switch. Like the Zettaguard, it supports 4 HDMI inputs, has picture in a picture mode, and has a wireless remote control. It’s incredibly well designed and is remarkably similar to the Zettaguard switch. The J-Tech Digital 4K HDMI switch looks almost exactly the same as the Zettaguard with a few minor differences. The only major difference on the front of the box is the red Auto switch and it’s indicator light. The Auto function makes it so that the display automatically switches to a device when it’s plugged in or powered on. By turning it off, the device remains fixed on the source you have chosen. 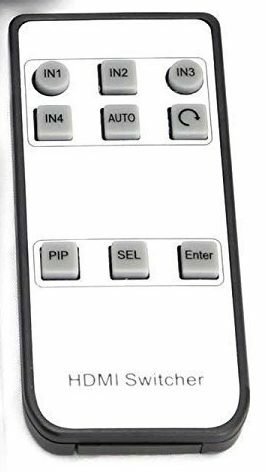 The J-Tech switch has the same amount of lights, HDMI inputs and even the same amount of buttons on the remote as the Zettaguard. However, the J-Tech remote has square rubber buttons that stick out from it’s face unlike the smooth Zettaguard buttons. While this type of button might be prefered by some people, it kind of gives it an “old calculator” feeling that seems out of place for modern tech. 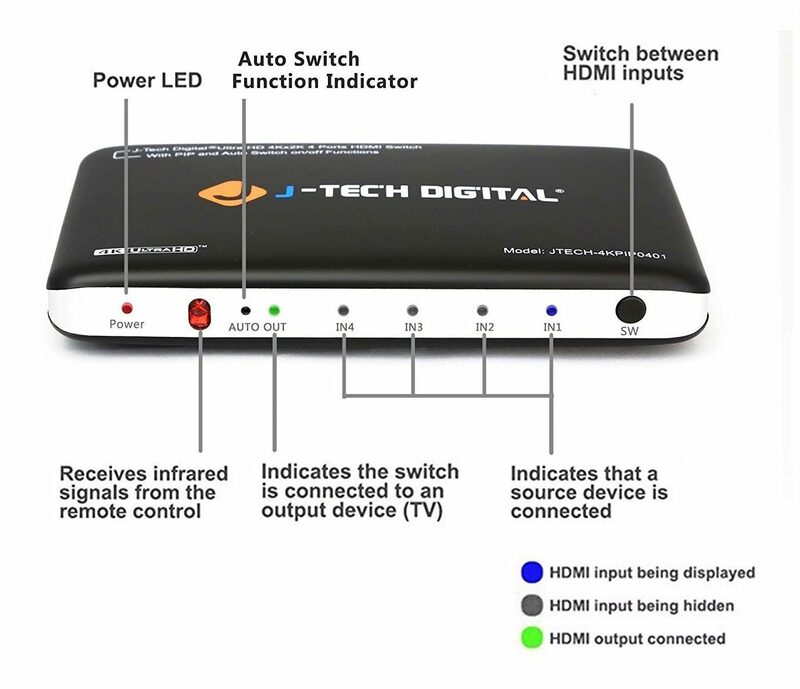 As a 4K HDMI switch, the J-Tech switch allows you to connect up to four HDMI devices in one HDMI port on your TV. It supports 4K x 2K resolutions as well as deep color, HDMI 1.4b, and 3D. We mentioned the Auto switch above that lets you turn on the Auto feature and automatically swap to a device as you plug it in or power it up. The J-Tech Switch also has a Picture in Picture feature, allowing you to watch all of your displays on the TV at once. If you want to watch the news on one display while keeping an eye on the game on another, you won’t have to switch back and forth between inputs. Navigation between displays while using Picture in Picture mode is simple and we ran into no issues with it during testing. The J-Tech is a fantastic switch and is basically interchangeable with the Zettaguard. In fact, the design and features are so similar that we tried to find out if they share a manufacturer. The major difference between the two and the reason we put the Zettaguard over the J-Tech switch is that there is a decent number of users who have complained their J-Tech device was a dud. After receiving the product and setting it up they had no indicator lights at all and the display remains black. For each case that this happened, J-Tech was notified and their devices were immediately replaced without issue. There is still an overwhelming number of users who had no issues (ourselves included), but we decided to mention it as a differentiating point between the two devices. The buttons on the remote would be another point against it, but that’s incredibly minor and strictly personal preference. If you’ve had a good experience with J-Tech over Zettaguard in the past or if you get a better deal on it, you should definitely consider it as one the best 4K HDMI switches. 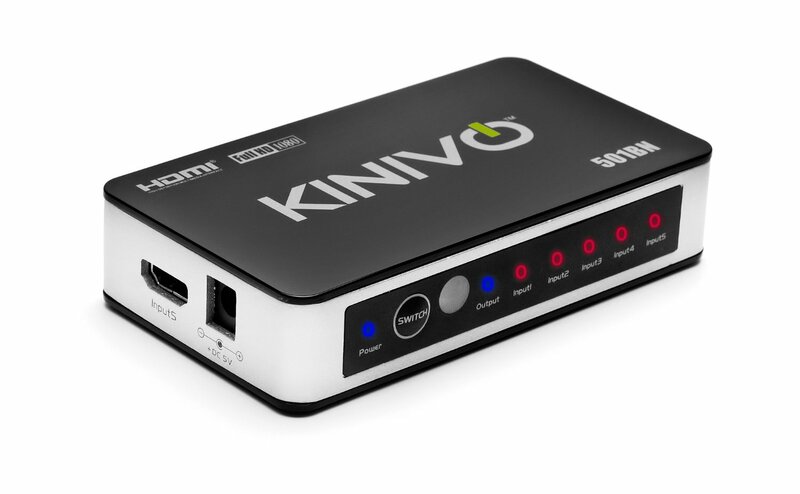 The Kinivo 501BM was released in 2011, but is still one of the best choices for an HDMI switch. It supports 3D as well as 1080p, but doesn’t support 4K like the two switches mentioned above. If the 2,000 Amazon reviews were a selling point for the Zettaguard Switch, having over 5,300 reviews must benefit the Kinivo 501BN. The Kinivo 501BM doesn’t look nearly as nice as the two previous switches. It’s designed purely for function, but is small and simple enough that it’s not too offensive. It may look like an icecream sandwich, but the reason for its boxy design is that it has five HDMI inputs instead of just four. The sacrifice of form for function is minor and could be a huge selling point if you need the extra input. In addition to its boxy shape, the fifth input also forces the switch put one of the inputs on the side rather than the back. With five HDMI inputs there’s a good chance your entertainment center is already cluttered with wires and not having them all contained in the back of the device can make things look messy. However, without any price increase from the Zettaguard to the Kinivo switch, it might be worth the extra slot. One of the main features that the previous switches had was Picture in Picture mode. Sadly, this is where the Kinivo 501BM starts to show what was sacrificed in order to add the additional input. If you were excited about the Picture in Picture possibilities of the previous switches, the Kinivo 501BM isn’t for you. 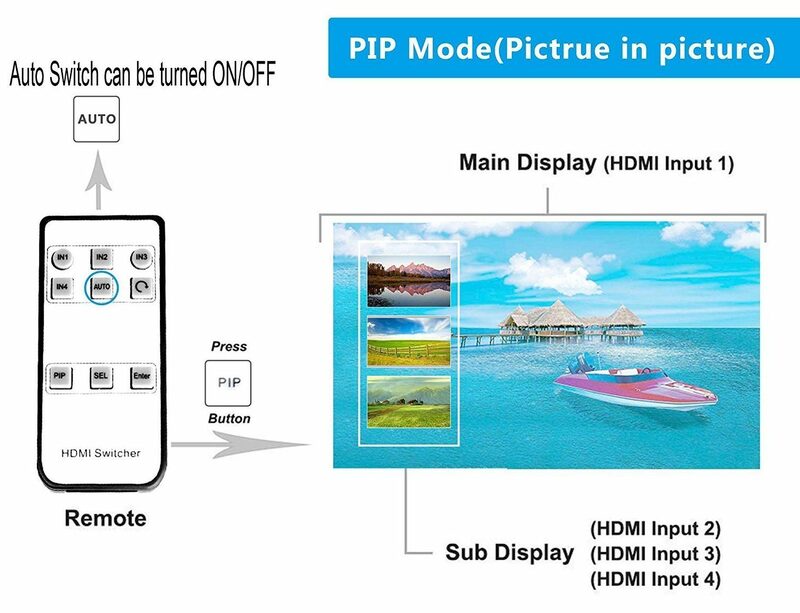 PiP mode isn’t a necessity for an HDMI switch, but it’s an added feature that you can really get used to. 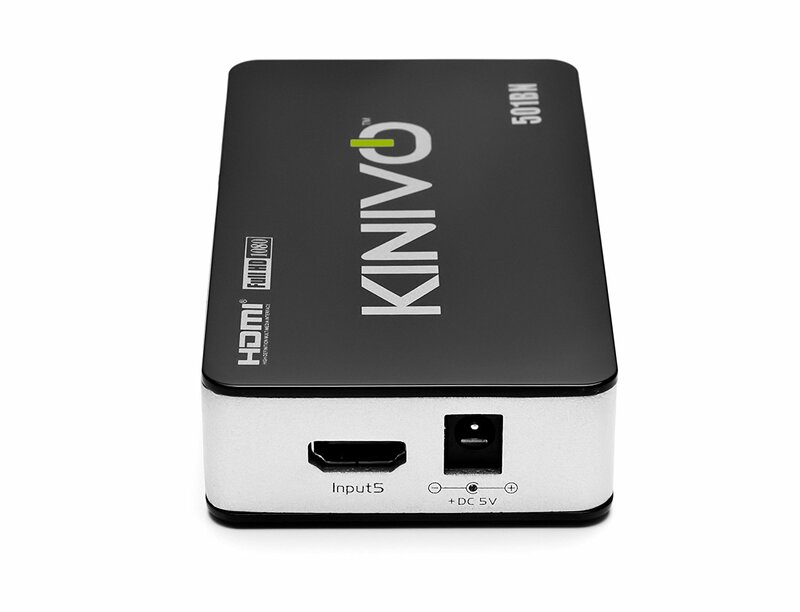 The Kinivo 501BN sacrifices features and not cost for an additional HDMI input. In addition to no PiP feature, the Kinivo 501BM doesn’t support 4K. A lot of households don’t have 4K yet, but we try and suggest products for long-term value whenever possible. As more services and hardware come out that offers 4K support, you don’t want to have to purchase a new HDMI switch on top of everything else when you make the swap. Seven years is a long time in the tech world for a piece of hardware. The fact that the Kinivo 501BM stood up to the test of time is quite impressive and goes to show the quality of the product. It’s the only switch on our list that supports five HDMI inputs, but is also the only one without 4K support or Picture in Picture. Both of these features aren’t mandatory in a switch and a lot of households wouldn’t use them even if they had the opportunity. 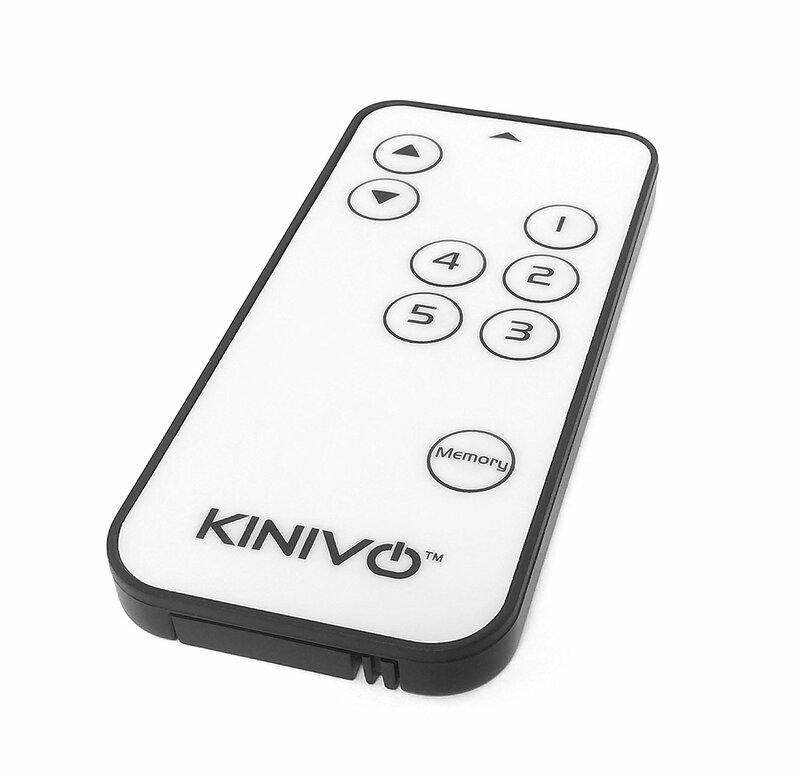 If you’re looking for a reliable, tested switch that offers the most room for growth, the Kinivo 501BM is a solid choice. We have close friends that have been using one for years and they’re still going strong. The fifth input might seem excessive at first, but once you start to count up your HDMI connected devices you realize how quickly it fills up. Between sound systems, streaming devices, gaming consoles, and other piece of everyday hardware, trading extra features for an additional HDMI port is quite enticing.